With the weather cooling a bit, it’s time to snuggle up with a blanket and a good book! But you’ll need a trusty bookmark to go with to hold your place. 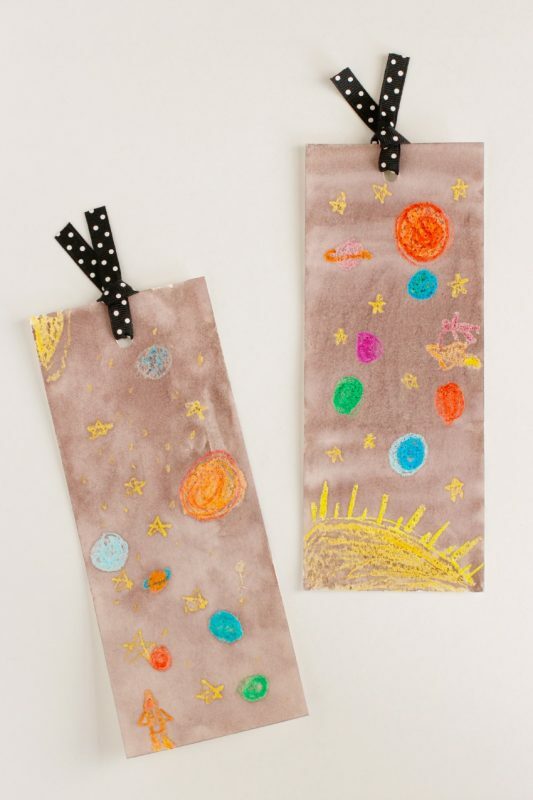 So we’re crafting Watercolor Outer Space Bookmarks with crayons and watercolor to give them an out-of-this-world look! 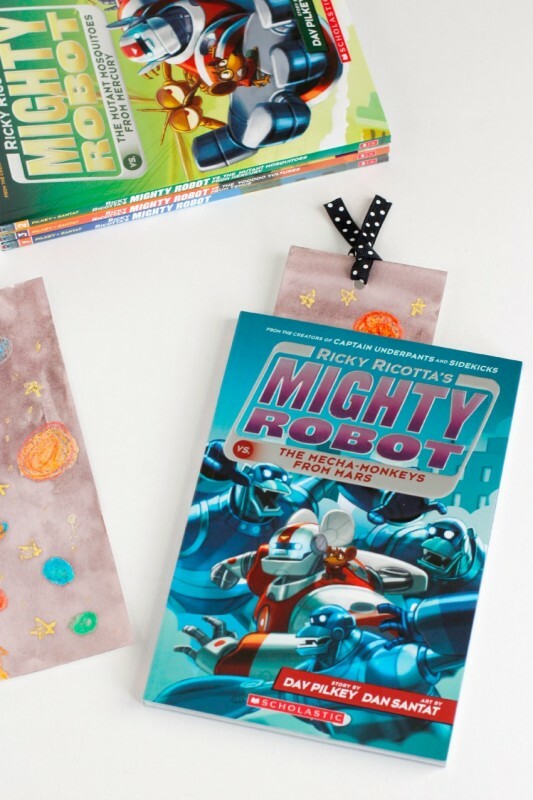 For today’s Outer Space Bookmarks craft, it was inspired by the children’s book series of Ricky Ricotta’s Might Robot by Dav Pilkey! My son has read most of the Ricky Ricotta’s books and loves them! And now Lucy is on her way through the series. Each book is a new adventure throughout the galaxy! 1. 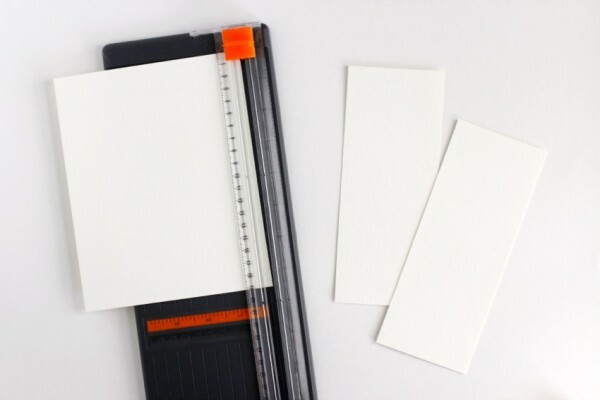 Cut your watercolor paper to size. To have enough room to color and paint, we made our bookmarks 3×6 inches. 2. 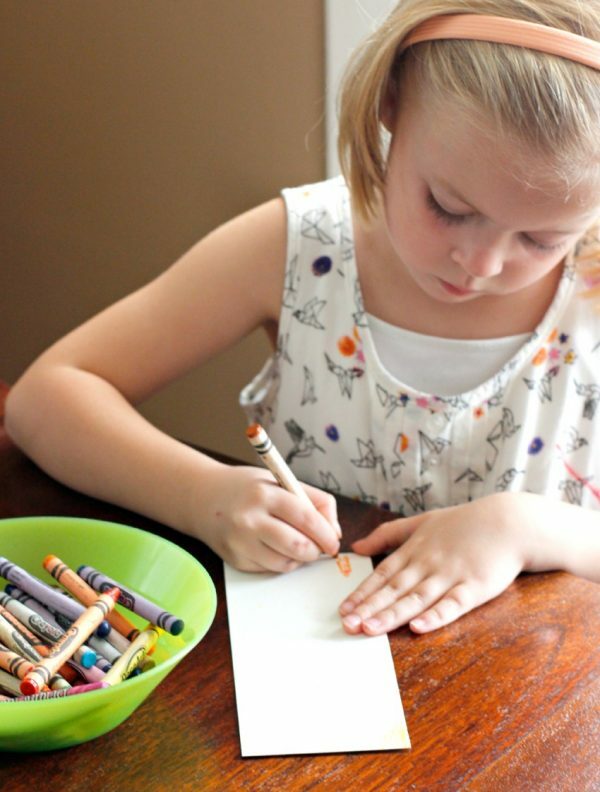 With crayons, color your bookmark. 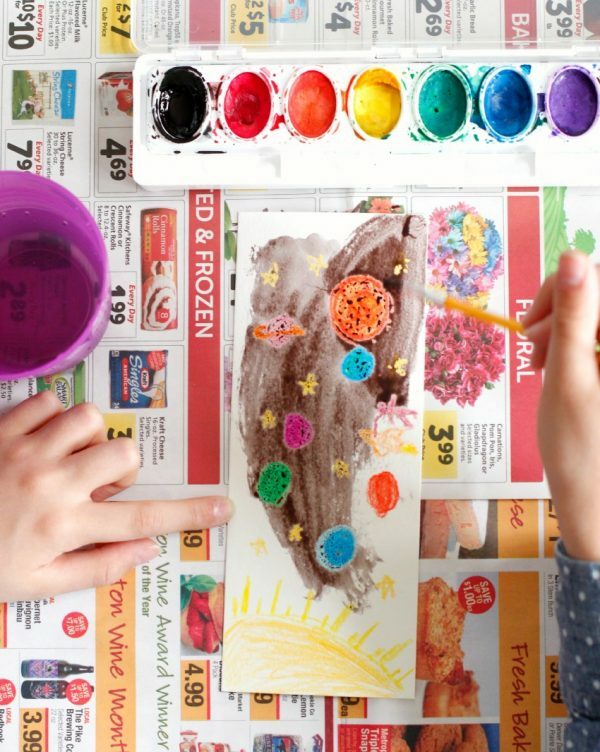 You can color any sort of fun spacey shapes you want; planets, suns, stars, aliens, moons, or rocket ships! 3. 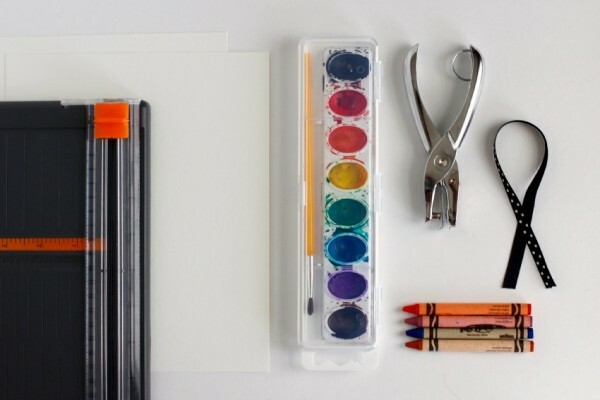 Set up your painting station: newspaper or paper towel, cup of water, watercolor paints and paintbrush. TIP: be sure to have something under your bookmark, as the paint will drip over the edge. Begin to paint with very watery black paint. You can use any color of paint you’d like, but the black makes for a dark space scene. 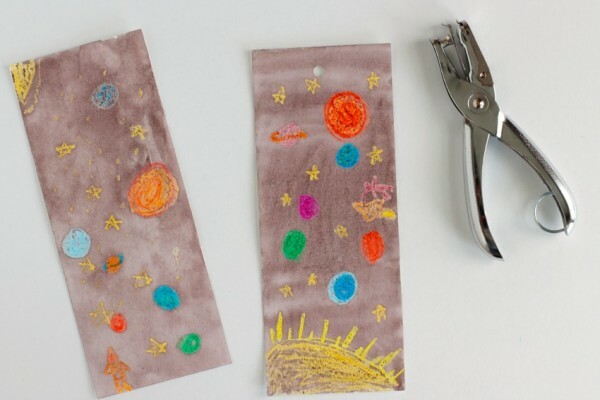 Make sure you paint all over the bookmark, covering the paper completely with paint. You’ll see that the watercolor doesn’t cover the crayons, creating a resist look. 4. Let your bookmark dry. It shouldn’t take too long. Then punch a hole in the top center of the bookmark for the ribbon. NOTE: this step is optional if you’d like to add a ribbon for a fun look or keep it as is. 5. Thread a 3-4 inch ribbon through the punched hole and tie it at the top. 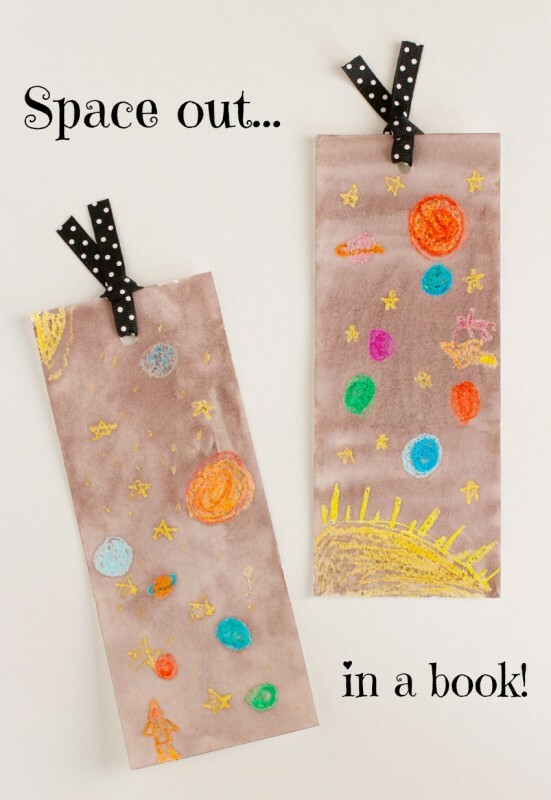 Now it’s ready to save your place as you snuggle up to your favorite book and your outer space bookmarks! *Thanks to Scholastic for sponsoring this post. Be sure to follow Scholastic and ScholasticTeach on Twitter and like Scholastic Parents and Scholastic Teachers on Facebook!